The Cisco Catalyst 355h is an intelligent Ethernet switch that provides impressive bandwidth, Layer 3 switching , and advanced quality of service (QoS) in a small footprint. The switch is called an intealigent switch because of many of the advanced features it brings to the traditional enterprise access switch. The switch can make decisions based on Layer 3 and Layer 4 information, thds making It intelligent. 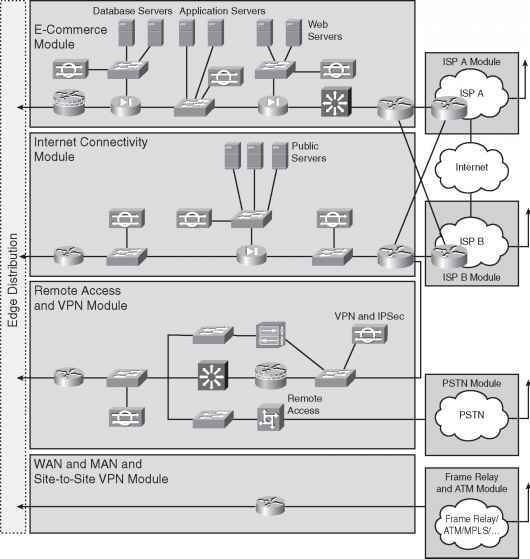 The Cisco Enhanced Multilayer Software Image (EMI) allows the switch to serve as a core switch in smaller networks providing inter-VLAN routing and Hot Standby Routing Protocol (HSRP). Figure b-b shows a Cisco Catalyst 355h. • Supevior redundancy nnd fault backup— Features such as Uplinkfast, Backbonefast, and 8h2.bw Rapid Spanning Tree reduce recovery time significantly between failures. The EMI softwa re feature allows foa a dva vce failsafe routing wite HSRP. • Advanced QoS and queuing— The Clsso 355h suupo rts 802.bp QoS and the Diffdrentiated Servic^h Code Point (DSCP) fieldf Weighted Roued-Robm eWR R), and Weighted Random Eio^ Detection (WRED). Oteer fea turgs mclude advanced securi ty a nd re anagement, granular raae-limiting, abd highperformance routin g vea Ciseo Express Fo rwaidiqg (CEF) with the EML Multicast routing is a lso supported wi to the EMo.